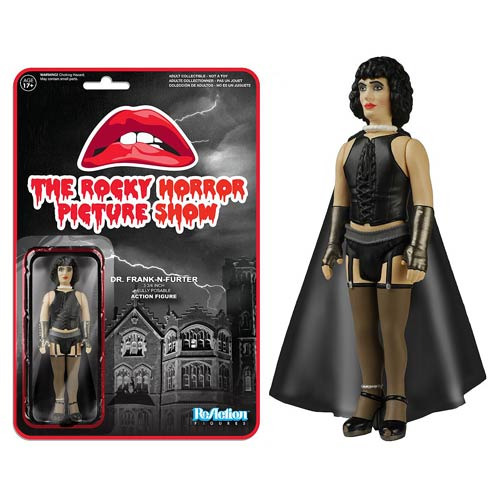 Shopping for Rocky Horror Picture Show Action Figures? He's not much of a man by the light of day, but by night, he's one hell of a toy. The cult classic movie about transvestites from Transexual, Transylvania gets the ReAction treatment! This Rocky Horror Picture Show Dr. Frank-N-Furter ReAction 3 3/4-Inch Retro Action Figure features the mad scientist as a retro, Kenner-style action figure. This figure stands about 3 3/4-inches tall and features 5 points of articulation as well as 1980s style blister card packaging for display. Ages 17 and up.